Gingivitis is a type of gum disease. It occurs when too much plaque builds up on the teeth. The bacteria that lives in this plaque irritates and infects the gums. Fortunately, it is treatable and in most cases can be reversed. The most common causes of gingivitis are overall poor oral hygiene. Infrequent brushing and flossing can lead to the development of gingivitis. Additionally, not visiting your dentist as recommended, typically once every six months, can lead to gingivitis. Other factors including diabetes, puberty, pregnancy, smoking, stress, autoimmune diseases, and some medications can leave patients more susceptible to gingivitis. Gingivitis is, in most cases, painless; however, there are plenty of other signs to watch for. Common symptoms include swollen gums, receding gums, puffy or tender gums, and gums that bleed readily when flossing or even brushing. You may also notice a change in gum color and the development of bad breath. We recommend visiting your dentist regularly. A professional cleaning at least twice a year can help prevent gingivitis. It is also important to develop and maintain a healthy oral hygiene regime at home. Brush your teeth (and tongue) twice a day and floss daily. You should also consider using an antimicrobial toothpaste and mouthwash, as directed by your dentist. If you start to notice any symptoms or think you may be developing gingivitis, make an appointment to see your dentist immediately. 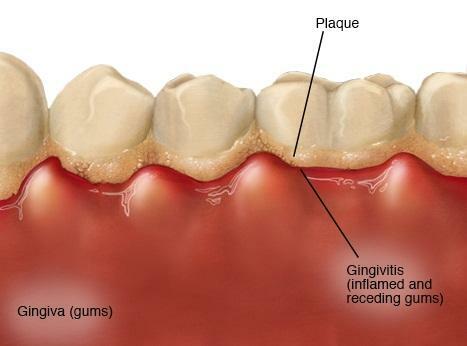 If left untreated, gingivitis can lead to periodontitis, which is a more serious form of gum disease. Periodontitis occurs when the bacteria infecting the gums becomes so extreme that the immune system begins producing components to fight back. Unfortunately, in addition to battling the gum disease, this immune response destroys the bone and tissues around the teeth. Once the bone and tissues are compromised, spaces form between the gums and teeth, leaving room for deeper infection. Eventually the teeth will feel loose and may need to be removed.